A fine Chelsea Porcelain Finger Bowl c.1755, painted with a large spray of mixed flowers, framed by smaller scattered sprigs, the lobed rims finished with a brown line, unglazed base. Dimensions: 8 cm diam x 7 cm high. Condition: small hairlines on the rim. Unmarked. A pair of Chelsea porcelain figural candelabra, c. 1765, one modelled as Cupid with a bow and quiver tied at his side, the other as his female companion, a basket of flowers in her right hand, both with arms outstretched to retain candle branches with scrolled drip pans and nozzles, an elaborately patterned drape around their waists and a delicate floral garland around their bodies, the scrolled bases picked out in gold and painted with brightly coloured butterflies. Dimensions: 30.5cm high. Marks: gold anchor marks. A Chelsea silver-shaped porcelain dish, red anchor period c.1755, painted with fruit and an insect in coloured enamels and gilt. Dimensions: 20cm. x 25.5cm. 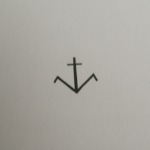 Marks: Painted anchor. Condition: some ware and a tiny chip near the rim. A Rare Chelsea-Derby Porcelain Coffee Can and Saucer c.1780, decorated in a rare pattern in coloured enamels and gilt. DImensions: can 5.5 cm high x 6.3 cm diam, saucer 13 cm diam. Fine condition, just a tiny nibble on the base rim of the can. 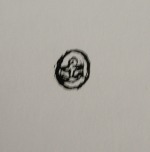 Marks: conjoined D and Anchor in puce (very rare) on the base. 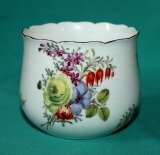 * A similar example is illustrated in "Derby Porcelain" 1748-1848 Illustrated Guide by John Twitchett, page 190. Chelsea-Derby Porcelain Coffee Cup and Saucer c.1775, delicately painted with swags and single flowers in coloured enamels and gilt. Dimensions: cup 6.5 cm high x 6.3 cm diam, saucer 13 cm diam. Marks: Anchor and D mark in gold. Condition: two small chips on the rim, minor ware on the gilding. Two Chelsea-Derby Porcelain Teabowls c.1775, fluted shape, alternating with acanthus leaves, decorated with floral swags in coloured enamels, gilded rims. Dimensions: 7.5cm diam. x 5cm high. Marks: Anchor and D mark in gold. Condition: one teabowl with a hairline crack, minor ware. 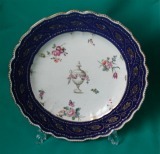 A rare Chelsea-Derby Porcelain Dessert Plate c.1775, by Constantine Smith*, the centre finely painted with ornate urn and garlands of flowers draped over it, surrounded by flower sprays, the wide border decorated in Smith's blue, gilded with scrolling anthemions between gilt and white dot pattern rims. Dimensions: 23 cm. diam Marks: Anchor and D mark in gold. Condition: The border partly re-gilded. *Constantine Smith was considered to be one of the best hands at Nottingham Road. He was a preparer of coloures and a china painter and gilder. It is believed thet the bright on-glaze blue known as Smith's blue was Constantine's discovery rather than that of his son, William. ** This pattern is illustrated in "Derby Porcelain" 2002 by John Twitchett, page 103. Chelsea-Derby Porcelain Tea bowl and Saucer c.1775, fluted shape, alternating with acanthus leaves, decorated with rose and leaf swags in green and gilt. Dimensions: bowl 7.5cm diam. x 5cm high; saucer 13cm diam. Marks: Anchor and D mark in gold. Condition: Fine, some ware on the gilding. All genuine Chelsea anchor marks are very small, any anchor mark over 1/4 inch should be treated with suspicion. A rare incised mark c.1745-50. Early marks: incised triangle and rare painted mark in underglaze blue c.1748-50. Anchor mark on small oval raised pad (Raised Anchor Mark) c.1749-51. Anchor mark (small size) painted in red (Red Anchor Period) c.1752-56. Anchor mark painted in gold (Gold Anchor Period) c.1769-75. Chelsea-Derby mark, painted in gold or enamel, c.1769-84.